With two months still left in the season, senior Ryler DeHeart has broken Michael Calkins' 2004 record for the most singles wins ever at the University of Illinois. 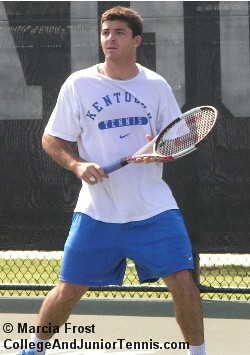 As of March 11th, the All-American has won 124 singles matches in his college tennis career. William & Mary men's Head Coach Peter Daub has been selected by the USPTA as their Mid-Atlantic College Coach of the Year. Former Middle Tennessee players Manon Kruse and Daniel Klemetz have been voted to the Sun Belt Conference 30th Anniversary Tennis Team. Manon is the all-time leader in both singles and doubles wins for the school while Daniel was a two-time All-American who held the number one ranking in the country at one point. Jesse Witten, who recently graduated from the University of Kentucky, is making a splash on the pro circuit. 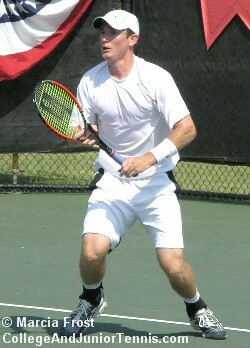 Just after a being chosen as a hitting partner for the USTA Davis Cup, Jesse won a $50,000 Challenger in Maine. Since turning pro he has also won ITF Futures titles in Ecuador. Dr. John Andrew Watson Jr., who coached at Virginia Union University for 43 years, passed away in February. Though he had resigned his coaching position in 1987, Dr. Watson had remained a teacher at the school from 1948 until his death. In an unusual move, the Big Ten Men's Tennis Protest Committee has reviewed the appeal filed by Northwestern regarding the placement of players during their dual match with Wisconsin. The committee ruled in favor of Northwestern, giving them the win by default based on the ITA Rule II.K.3, which states that "Players must play in order of ability." The USTA/Eastern Section held it's first Tennis On Campus Sectional Tournament. The event was held at the Binghamton Tennis Club in Edgewater, New Jersey. The Cornell team won the event. Other participating schools were Columbia and Rutgers.